PBVO/PGVO is an expandable braided sleeve constructed of PET (polyethylene terethalate) monofilaments to which flame retardant additives are added to ensure compliance with the self-extinguishing rating, UL94-VO. It is available in black and grey, has a continuous operating temperature of -50° – +150°C and is available in sizes ranging from 3mm to 50mm and can be cut as required. 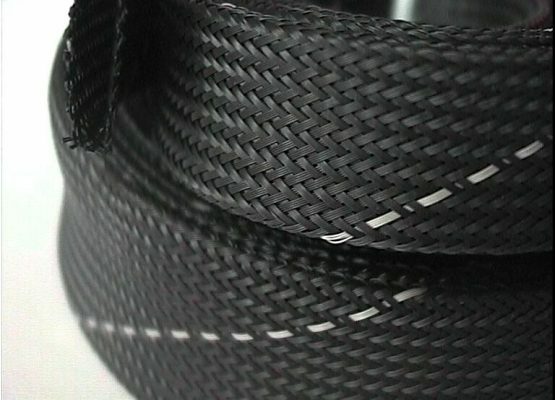 In addition to the mechanical protection, chemical resistance tensile and strengthening properties of standard PET braid, PBVO/PGVO expandable braid is UL94-VO rated. It is flexible, highly abrasion/cut and chemically resistant and readily expands over irregular shapes and bends before retracting. Also, being a braided jacket, it provides lightweight easy to apply protection that will not trap heat or moisture. It is often used in the mechanical protection and bundling of wire, cables, hoses and flexible pipes in all industries including harsh environments where VO rating is required.